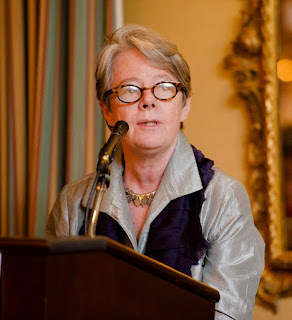 Reader’s Almanac continues its presentation of remarks offered at the New York State Writers Hall of Fame induction ceremony with Alice Quinn’s tribute to the poet Marianne Moore. Poetry editor of The New Yorker from 1987 to 2007, Quinn is Executive Director of the Poetry Society of America and an adjunct professor at Columbia University’s graduate School of the Arts. She is the editor of Edgar Allan Poe & The Juke-Box: Uncollected Poems, Drafts, and Fragments by Elizabeth Bishop. It is an almost fantastic honor to be offering a few remarks upon the induction of Marianne Moore into the New York State Writers Hall of Fame, especially in the presence of so many contemporary writers whose work I love who are present tonight to be inducted, too. I can close my eyes and see Marianne Moore’s picture in nooks and crannies and on the walls of the Gotham Book Mart, where I felt inducted into the literary life of the city in the early 1970s, guided by the writers who frequented that place and whose books the founder, Frances Steloff, would keep in stock at any cost. All of her great contemporaries admired her—W. H. Auden and William Carlos Williams, Wallace Stevens, T. S. Eliot, Robert Lowell, Elizabeth Bishop, and I am certain Gwendolyn Brooks. Moore, the great Modernist poet—who gave so much of herself from age 30–34, from 1925–29, as an editor of the manifestly supreme literary journal, The Dial, bringing along such writers as Hart Crane, Ezra Pound, and James Joyce—was a poet of such originality that her peers were always striving to characterize her achievements in the highest terms. Randall Jarrell noted, “She is, sometimes, as tersely conclusive as Grimm” . . . “Or as wise as Goethe” . . . “Or as beguiling, as full of propriety, as Beatrix Potter” . . . “Or as elevated as the Old Testament” . . . “Or as morally and rhetorically magnificent as St. Paul” . . . . Thank you for the opportunity to praise this unique and absolutely admirable American poet. A generous selection of Marianne Moore’s poetry can be found in volume #115 of the Library of America series, American Poetry: The Twentieth Century, Volume One.